It was a secret wish of mine to meet fellow bloggers in my area. Though we talk to each other almost on regular basis on FB and our blogs but meeting them face to face is a different experience all together. 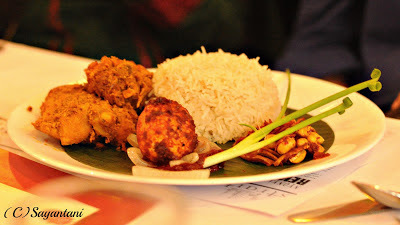 So when Zomato invited the Kolkata food bloggers I was happy beyond imagination. After much deliberation the date and venue was fixed on 22nd June at Straits. I had a prior appointment with my Doctor so reached there quite late and was cordially welcome by a very young team of zomato and 8 other fellow bloggers. We were seated comfortably around a huge table in a separate room opposite to the main dining area. After a short introduction we started talking about the food and restaurant scene in Kolkata. The young and vibrant group of team zomato had many fun stories to share along with great information about many restaurants that most of us are yet to visit. They were very open to suggestions and told us to share our views on many things. 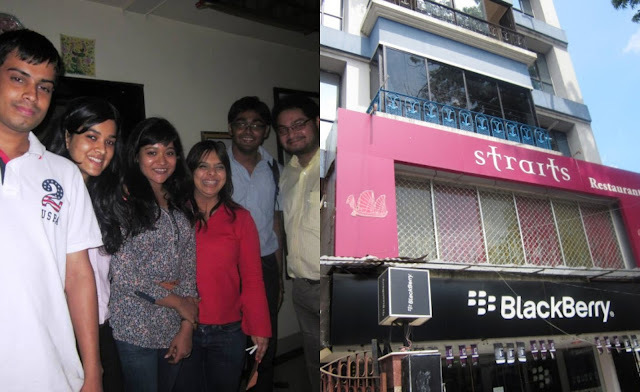 Amongst us Poorna, who already is a pro reviewer, talked about the availability and quality of various kinds of food in different parts of Kolkata. It was an eye opener for a comparatively new resident of Kolkata. As I hardly know about half of them. 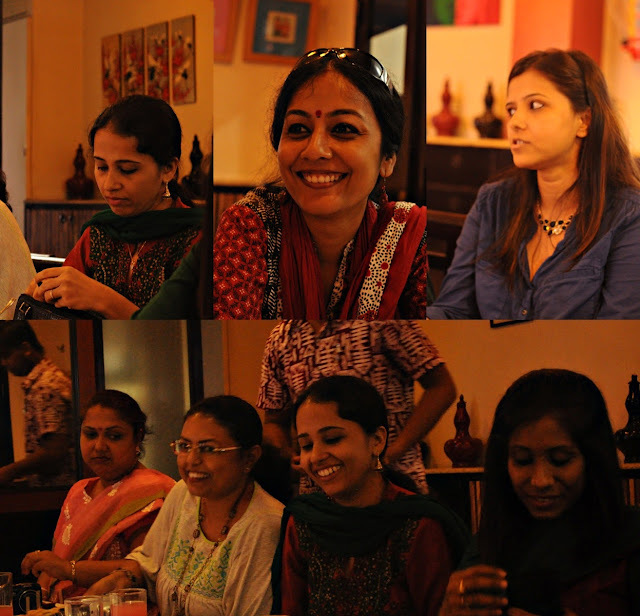 But with so many food enthusiast on the table we enjoyed the conversation thoroughly. In between all these talking and giggling the staff of the restaurant kept the food coming. 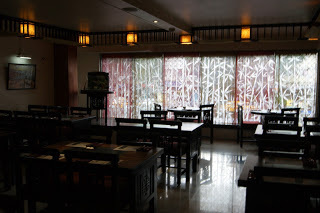 Straits, situated on Rash behari avenue mainly serves Malaysian and Singaporean food. Being a die hard south east Asian cuisine lover I was overjoyed to know this information. The décor of this place is very tastefully done, Simple and comfortable. With black oriental furniture, bamboo designs on the windows and paintings of famous architecture of Malaysia and Singapore on the walls it definitely is true to its food origin. 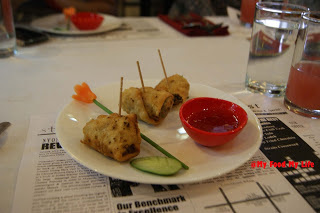 We were welcome by a reddish sugarcane drink along with popiah, a Malaysian chicken and peanut stuffed fried spring roll. Apart from the presentation I dint like either of them much. The stuffing of that roll was very dry and the skin very thick. For main course they served us Nasi Lemak but a look at that and I knew something was missing. 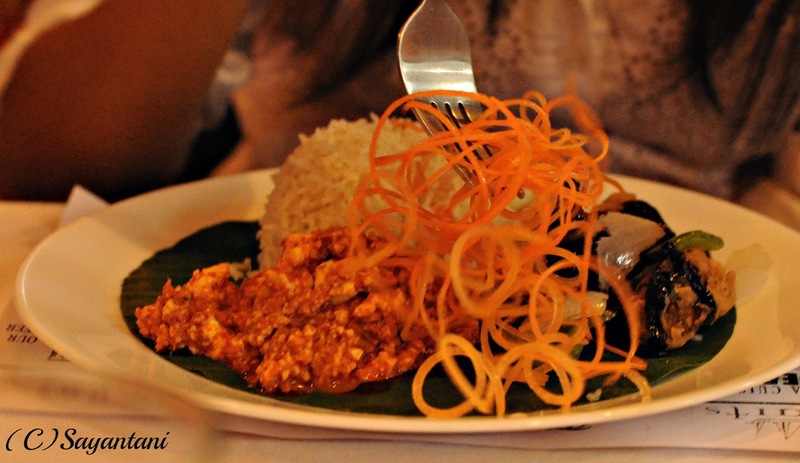 Nasi Lemak is a Malaysian breakfast dish. The main component is rice which is served with an assortments of items like Sambal, deep fried anchovies, peanuts, boiled eggs and fresh pieces of cucumbers. Often to make it more wholesome some other protein is also served. At straits they served the dish with chicken rendang. We love our nasi lemak and whenever we get a chance we order it. but this Nasi Lemak really disappointed me. I missed the delicate flavour of aromatic pandan leaf in the rice and it was not coco nutty enough for my taste bud. The sambal was not very fresh tasting and combining it with fried boiled egg took half of the fun of mixing and eating from it. The main highlight of any Malay food is its spiciness and a balanced sweet and sour taste which again was missed in the chicken Rendang. It was not spicy enough and was quite dry. Across the table Radhika was served Vegetarian Nasi lemak. The portion size was quite big even for a moderate eater like me and I really felt the guilt to waste half of it. The dessert was Sago Gula melaka, which again is another favourite. 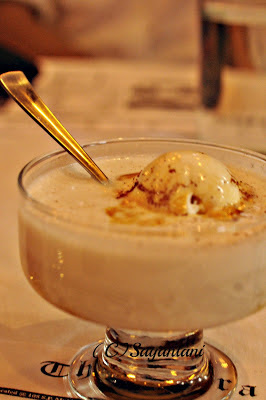 I liked the dish and its balance of coconut to palm sugar syrup. But what I dint like is the hard opaque sago. Sago pearls are very common for Malay and Singaporean desserts and they always are plump and transluscent almost like pearls. I suspect they dint soak the sagos for long enough to reach the glistening plump stage. When a Restaurant serves specialized food all we expect is authentic dishes, its not like home cooking where we substitute some exotic ingredient with some easily available one. We go to a restaurant expecting the real food with authentic flavour and taste, and Straits failed to meet that expectation. It’s a competitive world and with many restaurants importing and sourcing the proper ingredients from various parts of the World, Straits definitely needs to rethink and rework their menu and recipes. Apart from food the afternoon was well spent with like minded people. Team Zomato was very cordial and helpful. They made us feel comfortable with their warm smiles. 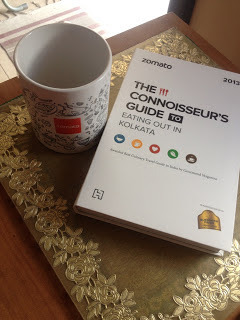 To end the beautiful meeting they presented us with a very helpful Zomato Kolkata Restaurant guide which my husband readily claimed as his own and a beautiful Zomato cup which now holds my son’s colour pencils. I was left with beautiful memories of an afternoon well spent and am not complaining at all. Popiah is never fried! Ki moja shobbar shonge dekha holo! Wish I was there. Good to see the faces behind the beautiful blogs. Wonderful write up Sayantani. Loved it dear. Wish i live in India, wat a wonderful meet and you have written beautifully..Good to see u all together. What fun Sayantani ! 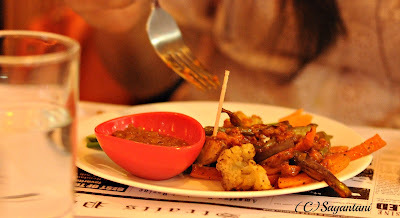 I wish I could meet some blogger around here :( Nice review, am sure you guys really enjoyed ! Very nice event, always lovely to meet new people! looks like you had a great time. a nice review too. I came across your blog while looking for some Kolkata food bloggers. How amazing! I missed the opportunity.